Pee Wee Reese, the dependable captain of the Brooklyn Dodgers for the better part of two decades, helped the Dodgers finally claim a World Series title. Not just limited to stats and records, his friendship and camaraderie with Jackie Robinson made it possible for the team to change baseball forever. 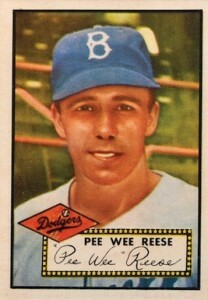 Using this list of the best Pee Wee Reese baseball cards, collectors can build a collection as nearly as great as he was. 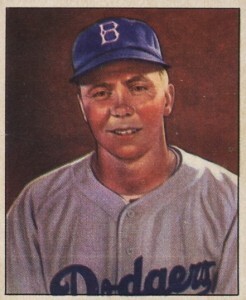 Shop for Professionally Graded Pee Wee Reese Cards on eBay. A common misconception was that Reese earned his nickname because of his small stature. Reese was hardly tiny, standing approximately 5' 10'', and his famous nickname came from his love of the game of marbles as a kid with a "pee wee" being a small marble. Originally a Boston Red Sox prospect, Reese was sold to the Dodgers and initially struggled with his new team. By 1942, however, Pee Wee started an impressive streak of ten straight All-Star game appearances. 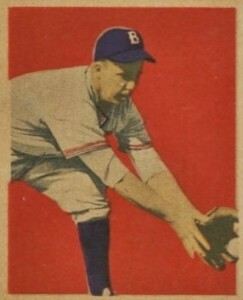 The streak was interrupted by his service in the Navy during World War II which cost him three full seasons (1943-1945) at the peak of his career. While he was never the power slugger, Reese was an all-around great player who would lead the National League in various categories throughout his career. He led the league in walks in 1947, while 1949 saw him lead in runs. 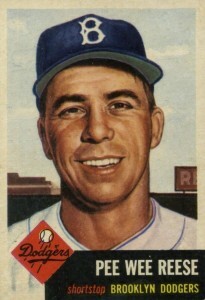 In 1952, Reese topped the league in steals and and he put forth the most sacrifice hits in 1953. 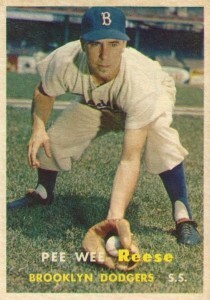 Pee Wee was also one of the most consistent shortstops to play the game as he took the field for more than 140 games each season between 1941 to 1956. In a time before the Golden Glove Award was created, Reese was regularly near the top of the putout and double play rankings. A few notable Pee Wee cards not featured on this list include his final appearances as a player in 1958 Topps. Reese was also included in the checklist towards the end of the Front Row All-Time Greats series which ran from 1992 to 1995. This includes a five-card mini set and one of the few on-card autograph in Pee Wee's cardboard history. One release that might interest Donruss collectors can be found in 2002 Donruss Originals which features Reese on a card that uses the 1984 Donruss design with its trademark wavy lines on the front. Reese is also regularly featured in new sets, including 2015 Panini Diamond Kings and 2015 Panini Cooperstown. 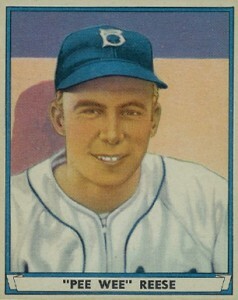 Pee Wee Reese's baseball card appearances straddle both pre- and post-World War II releases. In building this top list, an effort was made to balance each entry's value with card design and overall collectability. The smaller action shot on Pee Wee's 1956 Topps card is reminiscent of another famous card in Reese's card portfolio (see #3 on this list). While the reverse side of the card highlights the origin of Reese's famous nickname, it adds that it wasn't just his interest in marbles but that he won a marbles tournament that gave him his nickname. Researching it further, it seems that Reese was actually the runner-up in a marbles tournament held by the Louisville newspaper — The Courier-Journal — near his hometown of Ekron, KY.
Reese made his full-color photo Topps debut in 1957 Topps which also included complete year-by-year statistics for the first time on a Topps card. Along with "Pee Wee," Reese also earned the nickname the "Little Colonel" because of his team leadership skills. Fans of illustrated cards can never go wrong 1953 Topps and Reese's card features a very nice portrait. The reverse side reminds us that Reese replaced Dodgers Hall of Fame shortstop Leo Durocher when he was sent to the team from the Red Sox in 1939. Pee Wee seems to be squaring around to bunt on his 1952 Bowman card but based on the write-up on the reverse side of the card, I don't think Reese did much bunting during the 1951 season. He had the National League's longest hit streak, batting safely in 22 straight games and hitting .340 over the streak. While Reese did have a few certified autographed baseball cards before he passed away in 1999, collectors are much more likely to find a jersey or bat relic to add to their collections. 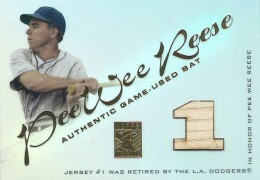 One of his first bat relic for Pee Wee can be found in 2001 Topps Tribute with the bat pieces cut to honor his jersey number. 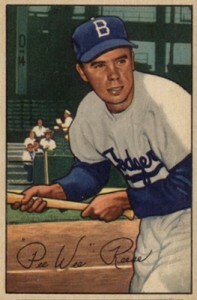 In terms of artistry, Reese's 1950 Bowman card is certainly one of the most beautiful painted cards in his collection. The reverse side mentions Reese's frequent appearances in the World Series and, although he captured a World Series title in 1955, he shares the dubious distinction of being on the most World Series losing teams with six. In terms of value, collectors are willing to shell out the most amount of money for a Pee Wee Reese card in 1952 Topps than any other set. It makes sense, as this is his Topps debut (he didn't appear in the smaller 1951 Topps) and his position on the checklist places him in the limited availability, high-number series. Not only does Pee Wee's 1953 Bowman card stand out among the other cards in that set, it is also one of the most iconic baseball cards ever made. In a time when in-game photography was not a technological possibility, Reese's perfectly timed double-play photo is still something to marvel at despite being staged. 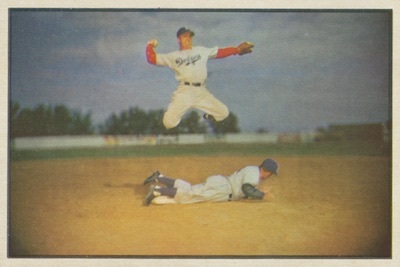 While many of the 1949 Bowman cards showcase players in posed settings, Reese again has a unique card of him in-action, this time going for a grounder. You can find grey or white back variations of this card but both are considered equally rare and have the same overall value. Pee Wee made his baseball card debut in one of the last great pre-war series — 1941 Play Ball. Outside of the key early appearances of Joe DiMaggio and Ted Williams, Reese's card is the most valuable rookie in the set and is able to reach $600 at auction for near-mint graded versions. 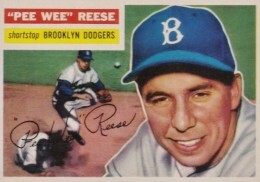 Is Pee Wee Reese’s autograph on a plain piece of paper of any value? I got one in 1954 at Tiger Stadium in Detroit. Have same kind for Roy Sievers.